Need help with garage door services in Salt Lake City? We have answers to your questions here. First, check to see if the red light is blinking on the wall button. This could mean that someone pushed the lock button. This is easy to fix by pushing and holding the lock button for 3-5 seconds and then releasing it. If your wall button does not have a lock button, the blinking red light probably means your remote needs to be reprogrammed. If reprogramming the remote doesn’t work, call Precision Garage Door of Salt Lake for further assistance. If the red light is not blinking on the wall button, replace the battery in the remote and try operating the door again. How do I re-program my remote? LiftMaster: find the “learn” button on the back or side of the opener and push it like a doorbell. Then push the button on the remote you wish to program to the opener. You should hear a click, and if there is a light bulb in the opener, it will flash. Genie: find the small black “learn” button on the front of the opener. Push it like a doorbell and you should see a small, blinking red light. Push the button you wish to program to the opener and the red light should stop blinking and remain solid. Push the remote again so that the red light turns off. When you push the remote again the door should move. For Marantec (PDS) Connect two remotes together with the provided programming connector. Push the remote that is coded to the opener first and hold it down (keeping it held down until the process is complete) – at the same time push the desired button to be programmed until the light stops flashing (a couple of seconds). When the flashing changes to a solid read light the remote is programmed and ready to go. Can you help me with my broken garage door after hours or on the weekend? Yes. We offer 24-hour emergency service at no extra charge. Absolutely. We back our work with best warranties in the industry on parts and labor. How "Green" is your Company? We are proud of our efforts to be environmentally responsible. We haul away and recycle your old doors and parts, and we utilize GPS systems, geo-targeted scheduling, and active dispatch techniques to reduce trip miles. Does my garage door require any maintenance? Yes, your garage door is the largest moving object on your home and requires maintenance. Follow the maintenance recommendations in your installation manual on an annual basis. Contact us for an inspection or maintenance. Can you make my garage door so it's not so loud and noisy? Yes, we can. Precision Garage Door of Salt Lake offers ultra-quiet garage door openers and super quiet ball-bearing rollers. One visit from us and you will have the quietest garage door in the neighborhood. My door opens very slowly; can I make it faster? Yes. You can adjust the opener to exert more force on the door. The greater the force setting, the harder the opener will push or pull the door. Never adjust the opener to a higher force if your door is unbalanced or sticking, and test the safety reverse system after adjusting the opener. 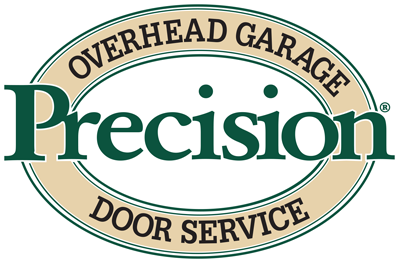 If the door is hard to lift, call Precision Garage Door of Salt Lake to adjust the door. We heard a loud noise in the garage and cannot open the garage door now. What could be wrong? It is possible you have a broken spring. You need an experienced garage door service technician to replace it. Contact us. Our garage door opener will not do anything when we push the button. What is wrong? First, verify the openeris plugged into the electric outlet. Next, confirm there is power coming out of the outlet by plugging the opener into another outlet with an extension cord. If the outlets are not the problem, then there is a mechanical or electrical problem within the garage door opener. Call us for a qualified technicianto diagnose the problem. My garage door doesn't close all the way. Sometimes it reverses at the bottom, or right after it starts moving. What do I do? Check the electric “eyes” on either side of the door frame. They detect objects in the way and reverse the door or disable the opener. If the “eyes” or beams do not face each other directly, they may cause spontaneous reversals. If you don’t have these “eyes,” then your opener is out of date. Contact us. This is potentially a serious problem, depending on how frayed the cable is. If it’s not bad now, it will get worse. You need a certified technician to replace severely frayed cables as soon as possible. I've lost the remote control for my garage door opener; can it be replaced? Yes. Contact us for help determining what type of garage door opener you have. We can install the proper remote controller to match the opener. We can make the lost remote inactive, anyone unwanted has it, they can’t use it to access the house. My door does not open or close far enough. What should I do? You may need to adjust the opener’s travel settings, which control the distance the door moves. Refer to your owner’s manual or call us for a tune-up and adjustment. We are happy to provide garage door services to Wasatch Front residents.